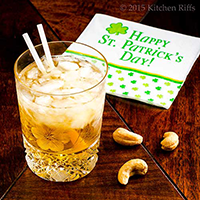 Boxcutters, Teaspoons, Jigger, Shaker Classic/Boston, Strainer, Straws, Rocks Glass. Fill a cocktail shaker half full with ice. Add all the ingredients (except garnish), and shake until well chilled (20 seconds will do it). Strain into a rocks glass filled with ice cubes or crushed ice. Add garnish if using and add straws. Serve and enjoy.